It’s not all in your head. You aren’t going crazy. Each day, as you stand there desperately clinging to a greasy pole, just trying to get to work, and you encounter yet another delay, you can tell yourself that it really is happening. The New York City subway is getting worse. The numbers prove it. By one of the Metropolitan Transportation Authority’s measures, the total number of delays in 2014 increased an astonishing 45.6 percent over 2013. Even the MTA’s less drastic numbers still point to slower service. More is at work here than meandering crowds of uncivilized cretins sullying the sacred shrine to transportation the the New York City subway once was. But the agency has no clear institutional explanation for the decline. That 45.6 percent number is officially known as the “12-month average of the system number of terminal delays,” and it comes from a report on the state of the subway in December 2014. A “terminal delay” occurs when a train arrives at its final station late, regardless of how long you might have had to wait for the train in the middle of its route. If one train is late to the last stop on its route, then that is one terminal delay. The other performance measure is called “wait assessment,” and it roughly measures how long you should be waiting for a train versus how long you do wait for a train. (Fun fact, New York City subway trains do run on a schedule, though it may not seem like it.) By wait assessment, performance is down too, though not as steeply. Click on the year below to see how often your trains are late by wait assessment or terminal delay from 2011 to 2014. The big increase in the number of terminal delays meant that on weekdays, the share of trains running late at the end of the line jumped from 18.1 percent in 2013 to 26 percent in 2014. And terminal delays tend to overstate the MTA’s timeliness, because a train can make up lost time at the end of a route, where stations are emptier, even if it ran sluggishly through the busy parts of town. In discussing the numbers, an MTA spokesperson took time to clarify that the agency doesn’t solely rely on terminal delays for judging its performance. By wait assessment, the dropoff from 2013 to 2014 was less severe: In 2013, 80.3 percent of weekday trains were on time, while in 2014, it was 78.8 percent—a decline of 1.5 percentage points. Still, 21.2 percent of trains arriving late is a cruddy performance, and commuter advocates have strongly criticized wait assessment as a metric, in no small part because the MTA only distinguishes between weekdays and weekends, rather than separating peak service from non-peak service. And most will tell you that rush hour trains can be terrible. It’s hard to directly compare New York’s performance with that of other cities, many of which evaluate themselves using different metrics. The New York subway system is more than a century old, built out of multiple competing lines, and its passenger load and round-the-clock service create a singular set of stresses. When MTA chief Jay Walder left New York for Hong Kong’s MTR system three years ago, he was jumping to a modern system that boasts a 99.9 percent on-time rate. For reasons that aren’t exactly clear, the MTA reports only break out the causes of a crappier commute when it discusses terminal delays, not wait assessment. So what’s going on with terminal delays? But that’s not obvious from the data. Click on the dates below to see the most common types of delays in 2013 and 2014. If maintenance and construction were behind the delays, we’d see the number of work equipment delays go up, and we have. But you’d think we’d also see an increase in the number of track worker delays. Yet from December 2013 to December 2014 track worker delays slightly decreased, from 6,475 to 6,304. Just as well, right-of-way delays (also called ROW delays, caused by malfunctions of switches, signals, and rails) are down from 9,802 delays to 8,594 delays. The weather wasn’t much worse either, going from 1,445 delays in December 2013 to 1,516 delays in December 2014, which is pretty much as near as makes no difference. The real increase appears to be from what the MTA is calling “over crowding,” which saw delays more than double. In December 2013, over crowding caused 6,942 delays, but in December 2014 that more than doubled, to 14,843 delays. In total, we’ve seen December delays jump 23,075 in 2012, right after Sandy, to 47,430 in 2014. You’d think those numbers would be chronologically reversed, but they aren’t. So far, the MTA hasn’t been tripping over itself to provide explanations as to why the city’s subway trains have suddenly gotten more packed than your average clown car. When I emailed, I received a response (which I’ve pasted in its entirety in a comment below) detailing the efforts over the past 10 years to protect workers, which is great, but it didn’t make clear how that relates to the overcrowding issue. While increased delays can lead to overcrowding on trains, there’s no evidence of a 1:1 correlation between this change and the overall overcrowding in the system. If delays were up in total by only 5,000 a month, that explanation would make a lot of sense. They aren’t, however; they’re up by almost 11,000 per month. An MTA spokesperson explained that despite the numbers that the subway is actually improving. To be fair, he’s not entirely wrong. Huge capital projects are currently underway for the subway, such as the 7 line extension to the far west side of Manhattan, and the Second Avenue subway line (which when eventually finished will only have taken over 100 years to complete, and for which inexplicable project delays and cost overruns are endemic, and for which state politicians constantly siphon off money for their own pet projects). That 7 extension, when finally done, should be all well and good, and the 2nd Avenue line, to be eventually known as the T train after a Q subway line extension, should go a long way towards alleviating the incredible pressure on the Lexington Avenue line, where the 4, 5, and 6 trains handle more traffic than the Chicago, Boston, and Los Angeles subway systems combined. 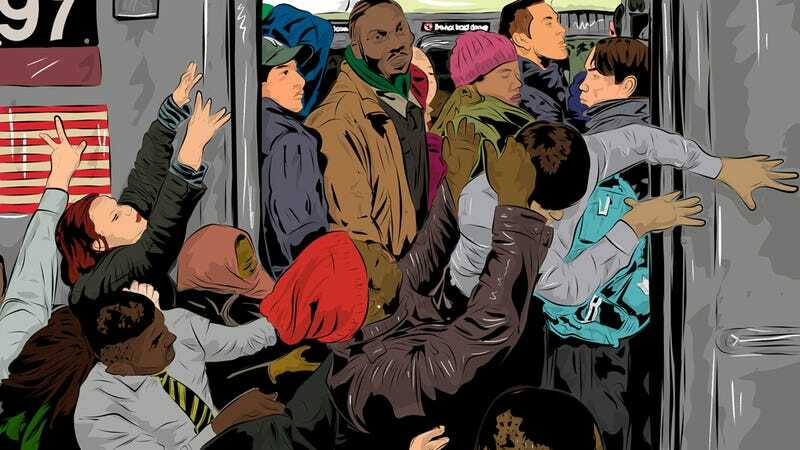 But overcrowding should be less a cause of delays itself than a symptom of other issues. One reason for overcrowding might be increased ridership, but while ridership has reached new and unseen-before heights, it isn’t up 113 percent to match the increase in overcrowding delays. A second cause of overcrowding could be that trains themselves are being removed from service, yet an MTA spokesperson told me that they haven’t been removing subway cars en masse, and despite an increase in mechanical failures among older sets of trains, the MTA has been replacing the decrepit with the shiny-and-new as soon as they’ve been able. Click on the chart below to see how old and how reliable your train cars are. So we’re still left with more questions than answers: Where are all these delays coming from?Why are they getting so much worse? With fares only expected to rise, will commuters see improving service at the same rate? The MTA has said it’ll take “further research” for more thorough explanations, but in the meantime, have a look at the reports yourselves, and proffer your own theories in the comments below.